Byzantine Empire, one of the longest medieval state formation, had a very specific artistic expression. In the first of several articles which will deal with this topic, we will get acquainted with some of its eminent emperors, buildings whose construction had prompted and art that developed in the Byzantine Empire in the first three centuries of its existence. The city was named after its founder, the emperor Constantine. The slavenic people called it Tsargrad, and it got its current name Istanbul after being conquered by the Turks. The emperor Constantine spent a lot of time on the Eastern borders of the Empire due to the war with Germania, so he mostly resided close to Little Asia, and rarely in Rome. That could be an explanation of why he chose this location to found a new Empire’s capital. After the „New Rome“ was founded, it was built and expanded rapidly. Many buildings were built, including the new hippodrome, palace, forums, administrative and clerical buildings, and the city was decorated with bronze statues. 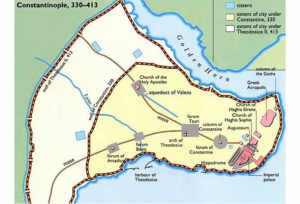 The emperor Constantine himself expanded the city four or five times. It was modeled in Roman style, though it was, unlike Rome, a Christian city from the start. In Rome, churches were built outside the city walls, whilst in Constantinople churches were built in the city itself.4 The bishop’s palace was built next to the emperor’s, which meant a bond between the holy and empire (emperor’s power being connected to religion). The cathedral and bishop’s residence were located in the narrow center, close to the Senate and the secular government. Following the fall of the Western Roman Empire, the Christian Empire continued evolving here, but it became Greek by its language and culture. The statues were appointed all over the city. They were pagan, but since they were extracted from the pagan temples, outside its religious context, they had merely a decorative function. Of all the statues, only one group was preserved – the horses that stood at the Constantine’s hippodrome. 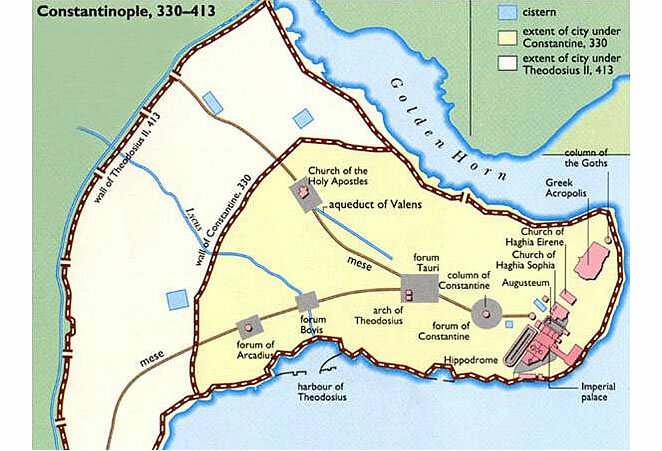 Theodosius was the last emperor who ruled the complete Roman Empire. He brought relative political stability to the Empire by giving certain privileges to the Barbarians. For instance, with the Germans he made a pact („foedus“) according to which the Germans had full autonomy, but were obliged to provide military service for the emperor whenever needed.6 He issued edicts that prohibited any pagan cults and forced closure of the pagan temples, as well as banned religious sacrifice. 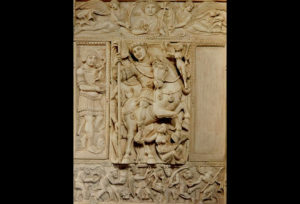 Pagan art had no useful function anymore, although it was still preserved. Before his death, in 395 AD he appoints his son Arcadius as the ruler in the East, and Honorius as the emperor in the West. The empire was thus separated, and Constantinople becomes rival to Rome. The Western Empire falls in 476 AD, whilst the Eastern survives, becoming the Byzantine Empire. It was Roman in its origin, but culturally and linguistically Greek, and essentially Christian. From the base of the obelisk posted by emperor Theodosius, formerly residing at the hippodrome, we can clearly see the trend in sculpture of that period. The emperor is displayed as the ruler of Persians and Goths who bring him presents. Sitting next to him is his western co-ruler, and next to him Theodosius’ sons Arcadius and Honorius. The emphasis is not on the individuals, but on the political hierarchy. The sculpture also shows a rising aversion towards the figuration and narativity of the classical sculpture, whilst the sculpture itself becoming more ornamental. It becomes closer to the provincial art featured by frontality, torpidity and disproportionality. Justinian is one of the most notable of Byzantine emperors, who, for a short period, succeeded in reconnecting the areas of the Western and the Eastern Roman Empire. He fought against the Vandals (north Africa), the Ostrogoths (Italy), the Visigoths (Pyrinees)… During his conquests he never took account of the new perils that started threatening the Empire. Those perils were the new, strong Persia, and the unstable northern border on the Balkan Peninsula. Justinian tried to solve the Balkan border problem by constructing a dense network of fortifications, but it didn’t prove to be especially successful as a solution. The peace was not made until Byzantium made a treaty with Avars, who were from then onwards obliged to keep the peace on the Balkan Peninsula. He was an activator of construction in the Empire, he himself started construction of thirty-three churches. The period of his reign was a time of enormous progress. The imperial workshop (in which various luxury items were made) flourished. Art craftsmanship also experienced large progress in his time. The church dedicated to the divine wisdom, was built from 532 to 537 AD, and the architects that designed it were Isidore of Miletus and Anthemius of Tralles. The construction was initiated by the emperor Justinian, with intention to build the finest building of all times, which shows an ambition to restore the Roman Empire. He wanted to build an unmatched structure, which would pose as a monument to the glory of the Church and a symbol of superiority of Constantinople over Rome, and at the same time it would have been a cenotaph to Justinian’s restoration of the Roman Empire. 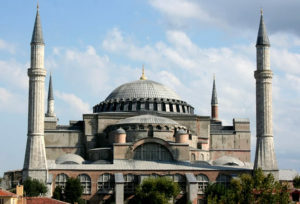 The church itself dominates the landscape of Constantinople. It has some elements of a basilica, but still differs in the construction of the dome and semi-dome, and its layout is almost quadratic, walls discontinued by the side naves, colonnades and galleries, rising through the semi-domes and four enormous pandatives to the incredible dome, that reminds of a shallow plate, with a diameter only 2,40 meters smaller than the one on the cathedral of St. Paul in London. It is a forty-window dome, which, by the words of a contemporary,looked not like residing on the firm ground but as if covering the space descended on golden chains from heaven.8 They didn’t spare on precious materials, and the workers came from all the parts of the Empire. Eight different kinds of marble were used for the sheeting of the inner walls. The porphyria walls came from Egypt, the green marble was hewn in Greece, and the entire church was covered in mosaics. 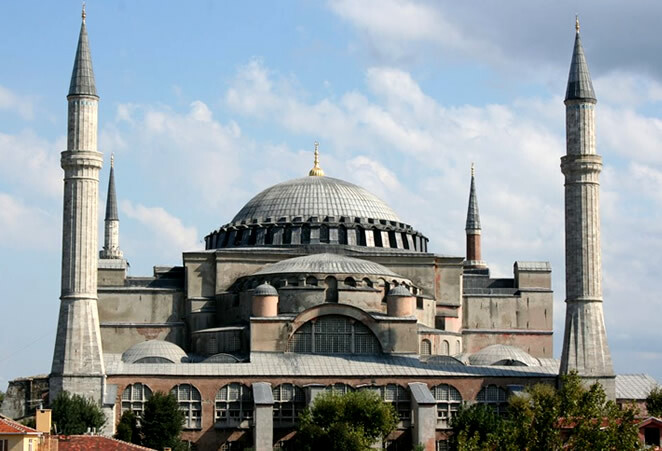 A description of Haghia Sophia from the 6th century mentions a golden altar covered in jewels, numerous chandeliers, woven golden drapes, silk curtains… The eastern apse was separated by a silver septum with two doors for priests and twelve columns entirely mounted in silver. The upper galleries preserve the only saved mosaics from the time of Justinian, when originally the whole church was covered with mosaics. Two important churches of this period, whose construction was also initiated by Justinian, are the church of Saints Sergius and Bacchus and Haghia Irena. 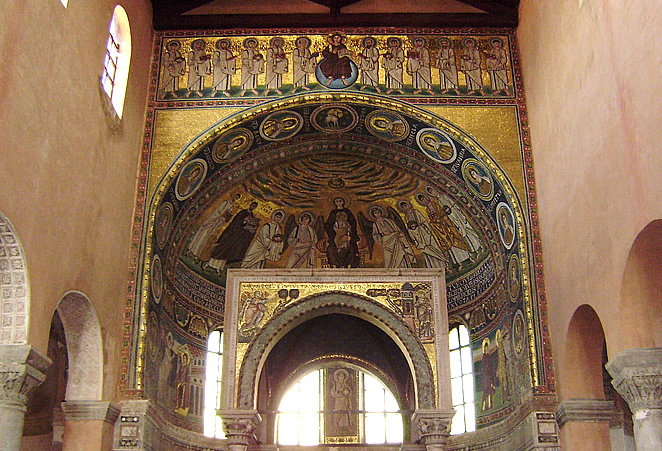 One of the most representative parts of the Euphrasian basilica are its mosaics which are located in the building’s apse. Apart from the artistic value itself, the mosaics also have an important iconographic program. The Virgin Mary is placed at the center of the apse, at a place regularly reserved for the Christ. She sits on a throne, with the little Christ in her lap, blessing with his right hand. Both sides are inhabitted by the two groups lead by angels. On the left side there are three martyrs holding wreaths in their hands. On the other side is St. Mauro, also holding a wreath, but has a name written beside his aureola. Next to him are, standing, the three contemporaries of that period, still alive at the time when they were displayed there. They are the bishop Euphrasius, holding a model of his basilica in his hands, archdeacon Claudius, who was Euphrasius’ brother, and Claudius’ son, the boy named Euphrasius. In the lower part of the triumphal arch there are thirteen circular medallions. 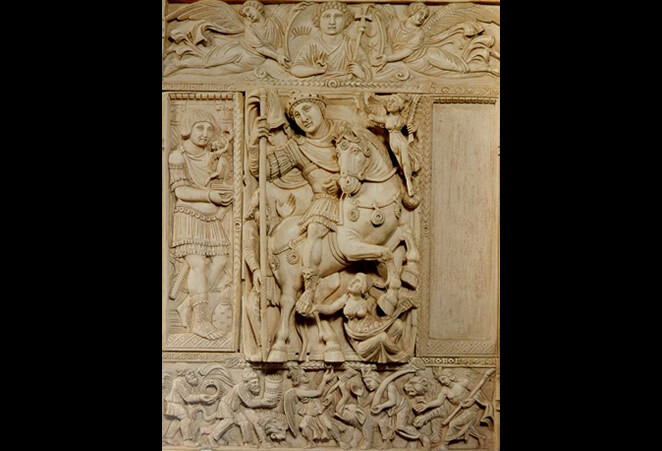 In the central area the Christ is shown as Agnus Dei, and on each side there are six more displaying various saints. In the highest portion of the apse there is a frieze with apostles and the Christ in the middle. NENAD CAMBI, Antika, Naklada Ljevak, Zagreb, 2002. MELITA TOMAŠEVIĆ (ur. ), Povijest svijeta, Split, 2005. THOMAS F. MATHEWS, Byzantium, From Antiquity to the Renaissance, Perspectives Prentice Hall, inc., Harry N. Abrams, inc., New York, 1998. JOHN JULIUS NORWICH (ur. ), Velike arhitekture svijeta, Marjan tisak, Split, 2005. 1 MELITA TOMAŠEVIĆ (ur. ), Povijest svijeta, Split, 2005., 333. 2 MELITA TOMAŠEVIĆ (bilj. 1), 333. 3 MELITA TOMAŠEVIĆ (bilj. 1), 333. 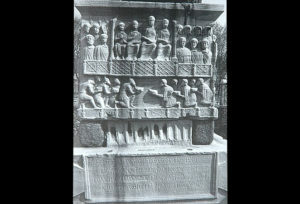 4 THOMAS F. MATHEWS, Bizantium, From Antiquity to the Renaissance, New York, 1998., 21. 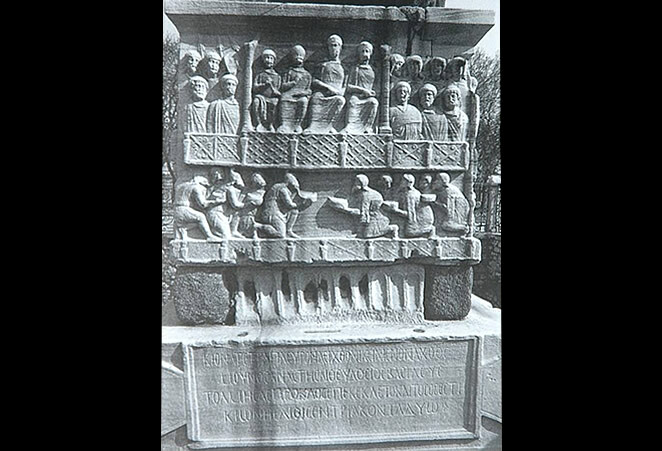 6 Which the Emperor Theodosius closed at the end of the fourth century. 7 MELITA TOMAŠEVIĆ (bilj. 1), 333. 8 MELITA TOMAŠEVIĆ (bilj. 1), 336. 9 JOHN JULIUS NORWICH,Velike arhitekture svijeta, Marijan tisak, Split, 2005., 84. 10 NENAD CAMBI, Antika, Zagreb, 2002., 245. 11 MELITA TOMAŠEVIĆ (bilj. 1), 336. Being half Greek and of Byzantine(Roman) heritage I find this very interesting. Hey Great Job! You should put some stuff on how the Byzantine Empire fell too. Awesome research!! Great Stuff But Its Preety Hard Tuh Understand. Congratulations for your well done report which I was pleased to read. I have been many times in Constantinopolis and a few times I went visiting Agia Sophia, the remains of the Roman walls and whatever else left by the great Roman and Byzantine civilization; it’s sad to see that a great empire fell to the Turks that transformed Agia Sophia in a mosque: respecting history, at least, would have proven the invaders to have some degree of civilization but it appears it was not the case. Anyway congratulations for your web site. This site just really helped me write a paper, thank you for all the helpful information. I really like the website on how its decorated and facted filled. Great job!! it was helpful on my homework and the webpage is really cool. I am writing an essay and thanks to this website I got a 97% on my essay. I really like this website. It helps my kids with their homework!! This is a good website I mostly got all of my notes from this website but I will need to know if this is true thing from the rise of the Eastern e,pore. I have been checking out many of your posts and i can state nice stuff.